Outdoor Tech is a successful start-up from Los Angeles, California. They design electronics that are meant to go everywhere you go. Say farewell the days of worrying about destroying your electronics. Most of Outdoor Tech’s products are dustproof, water-resistant and shock-proof to allow you the ultimate in portability. As well as functional design, Outdoor Tech likes to think of aesthetics in their designs. Their products are sleek and modern. They look like something you would see in The Jetsons. One of their most popular items is the Turtle Shell waterproof speaker. The original sold so well that Outdoor Tech designed a better model, the Turtle Shell 2.0. When looking at waterproof speakers, there are a few things you are guaranteed to find. The speakers should always have Bluetooth technology. This will allow you to keep your sensitive electronics out of danger. The batteries should also be built-in and rechargeable. This is 2016, you should never have to buy batteries again. The speaker should charge with a typical micro USB cable. You should not have to buy a special cable if yours is damaged. The length of the battery life is also something to take into account. The sound quality can vary greatly with wireless speakers. Most will produce decent sound quality and volume. However, there are a few speakers that will blow you away with the audio produced by a speaker their size. Speakers also can include a variety of other features. Many include an auxiliary plug for your older devices without Bluetooth capabilities. Some have microphones, which can be the best additional feature. It allows you to take phone calls hands-free. Increased durability is a must if you plan on being a little rough with your speaker. 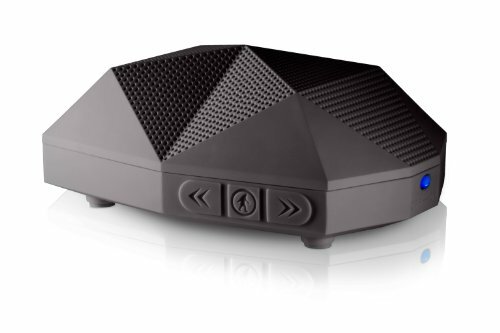 Shock-proof and dust proof speakers can go to the beach or get dropped and suffer no damage. The Outdoor Tech OT1800 Turtle Shell 2.0 looks really futuristic. It is shaped like a turtle shell. This allows the music to be directed in every direction to better fill a room. It comes in eight different vibrant colors, all of which look awesome. The Turtle Shell 2.0 is water resistant, but it can’t go completely underwater. It is shock proof and dust proof, so don’t worry about taking it anywhere. The battery life is 16 hours, some of the longest you’ll find on any portable speaker. The rechargeable battery is built-in and charges with a standard USB charging cable. At 1.3 pounds, you carry this speaker all day without feeling weighted down. The Turtle Shell 2.0 has a built-in microphone for hands-free calling. It is also outfitted with the latest Bluetooth 4.0 technology. A nice feature Outdoor Tech included is a voice. No more trying to figure out what all the different beeps mean! The Turtle Shell tells you it's powering on or off. It also tells you when the Bluetooth is connected or disconnected. The Turtle Shell 2.0 gets as loud as 96 decibels, so it can be heard over the party. You can also choose to buy different mounts and such if you would like to connect it to your bike or any other stand. However, you would have to purchase those separately. The cost of extra accessories can add up quickly. So how does the Turtle Shell 2.0 by Outdoor Tech compare to the other speakers on the market? Well, it is definitely a cut above the rest. Most portable speakers are still using Bluetooth 3.0, not 4.0. The Turtle Shell 2.0 employs Bluetooth 4.0. It works at the same 30-foot distance but uses less battery power as Bluetooth 3.0. Also, the connection between the devices is faster and stronger than Bluetooth 3.0. The battery life of the Turtle Shell 2.0 is the best you’ll find. Most speakers can offer about 6-8 hours, and 12 hours is considered higher quality. The Turtle Shell 2.0’s 16-hours is incomparable to anything you’ll find on the market. It charges with a standard plug, so it can use the same cable as your phone (except the iPhone). As for extra features, the Turtle Shell 2.0 has them all. It has an auxiliary jack with the cable included, so all your devices can connect. A built-in microphone is excellent quality. Many speakers the same size have microphones that don't work well. It is both shock and dust proof, making it perfect for all your travels. The sound quality from the Turtle Shell 2.0 is exceptional. It gets much louder than most portable waterproof Bluetooth speakers. It also has better quality at the louder volumes. Its bass doesn’t rattle and the treble doesn’t scratch. The design helps the sound to travel around the room, filling it completely. The only downsides to the Turtle Shell 2.0 are its price tag and lack of mounting capabilities. The price is worth it, as it is much better quality than the speakers in the $20-$40 range. The Turtle Shell 2.0 would also benefit from a strap that could hang it from the shower or attach it to the boat. If you want a portable waterproof speaker that really performs, the Turtle Shell 2.0 is a great option. The Turtle Shell 2.0 is a bit more expensive, but you get what you pay for. This one is worth the price tag.